Taking Rover on the Road? Vacationing with pets is more common now than ever, and a plethora of destinations now offer pet-friendly accommodations so your pooch can join in on the family fun. 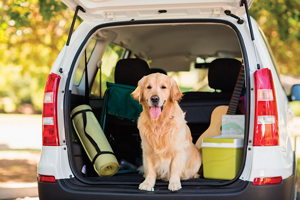 There is more to consider when bringing your four-legged friend on the road. A little planning goes a long way toward avoiding any travel disasters and ensuring furry family members have a safe and enjoyable trip, too. Lots of pets strongly dislike the car. One of the most common travel-related problems we veterinarians address is motion sickness and anxiety in the car. An anxious or queasy dog can set the stage for a miserable car trip for everyone involved and cause dangerous distractions for the driver. Thankfully, there are now many options to help your dog (and your family) travel in comfort. Talk with your veterinarian before you travel to come up with a plan for your pet. The right option for your dog or cat will depend upon the type and severity of his signs. Some natural options for anxiety include the Thundershirt, a tight-fitting vest that calms the nervous system of dogs and cats by providing deep pressure, and the Calming Cap, a hood made of semi-transparent material that covers a pet’s eyes and reduces visual stimuli. Another safe, effective option is a calming pheromone collar (Adaptil for dogs, Feliway for cats). These ingenious products are odorless to humans but release pheromones that are soothing for animals. For some dogs and cats, the motion sickness or anxiety caused by car trips is best managed with the use of prescription medications. Short-acting sedatives or anti-nausea pills can make a world of difference for some pets. Don’t be shy about asking your veterinarian for help making a plan so your dog or cat can travel in comfort. Hydration is important when traveling. Dogs cool themselves primarily by panting, and many dogs pant even more than usual with the excitement of traveling. All that panting releases water vapor from the body into the air, and dogs can quickly become dehydrated. Be sure to offer your dog a good drink of water every two to three hours at a minimum. Dogs get squirrely in the car, too. Pets will do better on a long car ride if they are allowed frequent pit stops. Take your dogs on a 5-minute leashed walk in a rest area once every two to three hours on the road. This habit will help avoid any accidents in the car, and allow the whole family to mentally and physically refresh. Buckle up the pets. More than 30,000 car accidents per year are caused by the distraction of a dog in the passenger seat. It also isn’t safe for your pet to be unrestrained in the car; in the event of an accident their small bodies can easily be thrown from a vehicle. The good news is there are many wonderful ways to safely restrain Fido on your trip. Even though your dog may be your copilot, he will be safest in the back seat of the car away from the airbags. The best options for pets and their human family members involve a harness or crate that is designed to be buckled into your car using a seat belt. Air travel for pets presents unique challenges compared with ground travel. The expense, risk, and hassle of traveling with your dog or cat is much greater when flying. It is very important to plan carefully, as each airline has its own set of rules regarding health certificates, crates, and what kinds of animals can be transported. Even if you have done your homework, have a back-up plan for your pet in case something unexpected happens the day you fly. Airlines will refuse to carry animals if the weather is too hot or cold, for example. Accidents and barking are not appreciated by fellow passengers in the cabin, and larger pets in the cargo area of the aircraft can be subjected to temperature extremes and turbulence. What’s the most important thing you can do for your furry friend before booking a flight? Seriously consider whether it is absolutely necessary for your pet to fly in the first place. Expect the unexpected. The excitement of traveling affects animals as well as people. Even a well-trained dog might not respond to commands as usual on the road. It only takes moments for a pet to stray too far in an unfamiliar environment and become lost. Make sure your pets have up-to-date contact information on their collars and bring their rabies certificates with you just in case. If you aren’t sure if your pet has a microchip, bring your pet to your veterinarian to find out, before you travel. It is fast and free to wave a scanner over your dog’s back to check for a microchip, and if he doesn’t have one yet, it is easy and relatively inexpensive to have one implanted. No anesthesia or sedation is required. The microchip itself is the size of a grain of rice, but when the unexpected happens, it can save your pet’s life. Next articleWarm (and I mean warm) August greetings, readers! 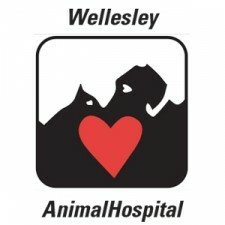 Alli Robbins, DVM, enjoys being the family doctor for dogs, cats, and exotic pets at Wellesley Animal Hospital in the far West End. She lives in Bryan Parkway with her husband, Danny, and their furry children.